It’s a tired but true cliche that every American Vice President is just a heartbeat away from the most powerful job in the world – a job they’ve often never really interviewed for. Who are these people? Over more than 200 years, the American voters have sent a platoon of rogues, cowards, drunks, featherweights, doddering geriatrics, bigots and atrocious spellers to Washington D.C. to sit one bullet, cerebral hemorrhage, or case of pneumonia away from the highest office in the land. Veeps tells the sordid, head-scratching, perversely-entertaining stories of these men we’ve chosen to ride shotgun in the biggest rig in democracy, without ever seriously considering the possibility that they might have to take the wheel. I never thought there was anything funny about our Vice Presidents, until I read Veeps, a welcome, often hilarious respite from the tedium of national politics. Here’s the weird skinny on the Little Guys waiting for the Big Guys to sneeze. But jeepers creepers who are these Veepers? Here’s everything you were afraid to know about the most powerful men in the world (almost). One of the funniest political books you may ever read, and educational as well! 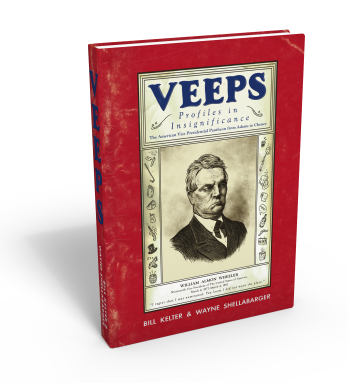 Veeps is the perfect election companion, whether you’re duck hunting with Cheney or buying Prada with Palin. What a fine read! … More wacky wonkyness about the guys who put the vice in Vice President than anyone could have ever imagined. The caricatures are great. I enjoyed Veeps with great relish… a hit! Holy cow, did I ever enjoy reading Veeps.